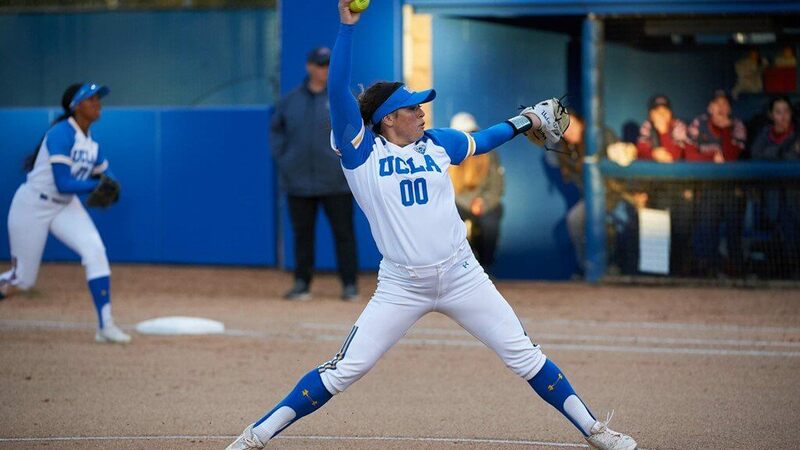 Rachel Garcia of UCLA was the National Player of the Week for her pitching and hitting against the Huskies. Photo: Don Liebig /UCLA Photography. A strong showing in its conference opener solidifies UCLA’s spot atop the rankings, while the Top 5 remain unchanged. Also, Alabama stayed undefeated and UNLV joins the rankings for the first time this season. A three-game sweep of Washington that included a run-rule win in the series’ finale make the Bruins the undeniable championship favorites through the first six weeks of the season. The Sooners hold steady in the top two after a perfect 5-0 showing on the week. The week included run-rule wins over Loyola Marymount and Illinois. A loss to Notre Dame in the middle of a conference series wasn’t enough to knock the Seminoles out of the top three. The Crimson Tide remain perfect on the year, with six wins on their trip to Hawaii, but still lack a plethora of quality wins. The spotless record is a high mark in the Tide’s favor in their spot as the SEC’s highest-ranked team. After a midweek win over Middle Tennessee State, the Lady Vols swept a pair of games against BYU and split in a two-game set with Texas. The Tigers showed out as they hosted Florida in a conference series, winning the series with a 2-1 showing against the Gators, with the only loss coming on a Gator walk-off. In the conference opener, the Wildcats swept a three-game set over Oregon, recording run-rule wins in back-to-back games to open the series. Midweek victories over Baylor and Nicholls State will both be feathers in the Cajuns’ caps, and they stayed perfect in conference play with a sweep over Troy. A walk-off win to open the series ultimately saved the Gators from a sweep against LSU, which put the Gators under .500 in conference play. Visiting Knoxville, the Longhorns swept past BYU in a pair of games, and split with Tennessee, losing once to the Lady Vols before emerging victorious in the teams’ rematch. Opening their Pac-12 slate, the Huskies were embarrassed by UCLA, losing all three games to the Bruins, including the series finale in run-rule fashion. The Red Raiders took just their second loss of the season in a surprise upset defeat to Memphis, but finished the week 3-1 after playing a travel-induced shortened slate. Moving into their highest ranking of the season, the Gophers went 4-1 on the week, with the sole blemish a loss to upstart Florida Gulf Coast. Rachel Lawson’s club continued their red-hot start to conference play, sweeping through their second-consecutive SEC series, this time over Mississippi State. A week off didn’t keep the Badgers from moving up in the rankings, thanks to some other teams’ struggles. The season rebound continues for the Tigers, as they posted a perfect 4-0 record on the week, with a series sweep over Texas A&M. The Cowgirls’ trip eastward provided mixed results, including a pair of victories over Central Arkansas and Samford, but back-to-back losses against Ole Miss in Oxford. With a 2-3 record on the week, the Bulldogs created a lot of questions about their season’s outlook; the losses including a single-game defeat to North Carolina and a series loss to Missouri. Despite carrying a lighter workload than many of their ranked peers, the Dukes posted a perfect 4-0 showing on the week. Facing off against North Carolina State, who were ranked early in the season, the Hokies swept by the Wolfpack, taking three wins in the weekend series. The Hoosiers suffered possibly their worst week of the season, ending up 4-3 on the week, with losses to Florida Gulf Coast, Ohio, and Northwestern. Hosting Oregon State in a conference series, the Sun Devils took the series win, despite dropping a single game to the Beavers. Fresh off of their series win over Arkansas, the Rebels posted a perfect 4-0 record in their home tournament, taking a pair of wins over both Samford and Oklahoma State. The Gamecocks’ struggles in conference play continued with a series loss to Arkansas, dropping the squad to a 1-5 record in the league. Jumping into our rankings for the first time this season, the Rebels took a series win over Boise State to open Mountain West play, in a series that could play into postseason consideration.